That glorious person, who is both Lord and Jesus, and Christ, has suffered, and done, and promised, such things that might gain the love of sinners to himself; and by these he pleads with them, to set their affections upon him. In opposition to him, the world and sin stand in competition with him, for the love of man's heart. Jesus calls, "Sinner, love me!" Sin and the world cry, "Place your love on us!" The Spirit, the Word, ministers, mercies, and a well-informed awakened conscience, press hard for the love of man to Christ. The devil and the flesh solicit for the heart of man, for sin and world. Love man has, and one of these he will love. He cannot love both at the same time, with a supreme love — for either he will hate the one, and love the other; or else he will hold to the one — and despise the other. "You cannot (love and) serve God and mammon," Matthew 6.24. Predominant love to the one, is inconsistent with such love unto the other. "Do not love the world, neither the things that are in the world. If any man loves the world — the love of the Father is not in him." 1 John 2:15. This considered, what thinking man can forbear to grieve, abstain from floods of tears, and bitter lamentation — when he sees that the love of man, such a noble affection in itself — is set so much on sin, which is so bad in itself, and unto its lovers, and upon the world — which proves vexation to those who are so fond of it, who love and vex, who vex at it, and yet still continue and increase their love unto it, and their vexation by it does not abate their inordinate affection to it; while Christ, who is the primary, principal, and most delightful object of love — is slighted by so many, even by the most? Blind sinners! Do you thus love sin which is so vile, and the world which is so contemptible — and not Christ, who is altogether lovely and desirable? What perverseness is this — that Christ who is best in himself, and best for them — should be refused; and sin which is worst in itself, and worst to them — should be embraced? What folly and madness is this, that Christ should be kept out, standing at the door — when sin and world are admitted in, and lodged, and kindly entertained in the chief room of their hearts! Cursed doings! When sin should have no love — shall it have all a man's love? When Christ should have all a man's love — shall he have none? When the whole world should be as your footstool — shall it, or anything in it, be set up in your hearts, as in its throne? How is it that you are so much mistaken, as to think see beauty in deformity — and deformity in beauty itself? Why is odious sin so lovely — and a precious Christ so unlovely in your eyes? Have you considered what sin is, and what Christ is — that you have greater love to that work of the devil, than you have to God's own Son? And this, when sin is so evil and vile, that, as sin, it cannot be loved by the worst of men, until it is first disguised, and dressed up with the appearance of good; and Christ is so good, that as Christ, he is to be loved most of all? When called, invited, and charged, in the name of God, by the ministers of Christ, showing you God's call, invitation, and charge, to love this lovely Jesus — why do you retort and say, "What is your beloved above another beloved, O teachers of Christ? What is your beloved more than another beloved, that you so charge us?" How long will you say, "He has no form or loveliness? We see no beauty in him that we should desire him?" How long shall Christ complain of you, that you hate both him and his Father? And is not this complaint more grievous, when you hate hint without a cause, and do not love him — when there is so much cause and reason why you should? What has sin and the world done for you, and what has Christ ever done against you — that you love your worst enemies and hate him who would be your surest Friend? Has sin afforded you pleasures? But how long will they last? And what will you do when the pleasures of sin are past and fled away — and the pains and punishment for sin are come, and shall never, never, pass away? Has the world allowed you its profits? But whose shall these be, when you are dead, and lodged in the dust? What profit is there in all your profits, if you gain them — and lose your souls? Will not your gain be your everlasting loss? Is Jesus the admiration of angels — and is he your derision? Do they adore him — and do you thus despise him? Do holy saved souls in Heaven, delight and rejoice in their love to him, and in his to them — and do you turn away your love, and alienate your hearts from him, and love sin, and rejoice in that your love? Do holy souls on earth, in this imperfect state, cry out, "Whom have we in Heaven but Christ, or what is there on earth that we desire, or love, in comparison of him?" Do you prefer your lust, and fleshly pleasures, and worldly profits — before him? Have you done so, and will you still continue? Are you so resolved? Are your hearts so hardened? Are your minds so blinded, and so enslaved to sin and Satan? Alas for you! You born without love to Christ — and have you lived so long without love to him? And will you die at last without love to him? Where are the mourners, that they may with flowing tears bewail your sin and misery? Why do you love your sin? Because you do not love Christ. Why your misery? Because you must be Anathema! — accursed when the Lord shall come. Alas for you, who are ignorant of Christ — for you cannot love whom you do not know. Alas for you, whose hearts are full of love to a vain, deluding world, and empty of sincere love to Christ! For you must all be Anathema! — accursed when the Lord shall come. Let angels blush! Let the heavens be ashamed! Let godly men weep! Let the earth mourn, let all the creation of God sigh, and sob, and groan — that the Son of God is not beloved by so many of the sons of men! O my soul! where is your love to these poor souls, empty of saving love unto your Lord? Where is your sorrow for their lack of love to Jesus? Where are your feelings of compassion to those who have no pity on themselves, in that they will have no love to Christ ? Do you not know that Maranatha! — the Lord will come? And are you not sure, that then they will be Anathema! — under a bitter and eternal curse? Do you see how the devil turned men's hearts from their Lord Creator, and how he keeps their love from their Lord Redeemer — for which the devil gloats over them — and will not you be grieved for them? Blessed Jesus! I am ready to blame them, because they do not love you — yet I blame myself for lack of grief in me, for lack of love to you. Methinks that godly parents should mourn, because they have a child, or children, who do not love Jesus Christ, and say, "What! they love us — but not the Lord! What pleasure can we take in their love to us — when they have none to Christ?" Methinks the children who have love to Christ should weep and bitterly lament, to be loved by their parents with a greater love than they have for Christ. The wife who is a lover of Christ, should be filled with sorrow, that she has one so near — who is so far from loving the only Savior, and say, "Alas! alas! My husband will be Anathema!" Weep then, weep, weep abundantly, for any in your house, among your relations, friends, acquaintance and neighbors, who are not lovers of Christ. Oh! that your heads were waters, and your eyes fountains of tears — that you may weep day and night, for those who do not love the Lord Jesus. How can you go with dry eyes, without tears trickling down your cheeks, one hastening to overtake the other, when you behold non-lovers of Christ, and consider next, Anathema, Maranatha? Oh! that you had in some wilderness a lodging-place of wayfaring men, or some retired corner in your house, that you may leave your worldly business for a while, and go from them, to wash your faces in your tears — that your dear relations do not love that Lord of yours, who is dearer to you than they are, or all this world besides. Weep most bitterly, when you think how by them your dearest Lord is undervalued, and their precious souls are endangered — by their not loving of him, for they must be Anathema when Maranatha. Alas, poor loveless souls! The Lord will come, will surely, quickly come — and then they will be miserable — surely then they will be miserable souls indeed! But is this enough for you, O you non-lovers of Christ, that others lament your woeful case, while you yourselves spend your time and waste your days in sinful loves, and carnal delights, and sensual joys? Were you convinced of your present sin, and did you see your future approaching misery — could you be so full of mirth, upon the very borders of the place where there is weeping, and wailing, and gnashing of teeth? Could you laugh and joke, so near the bottomless pit — where your laughing shall be turned into mourning, and your mirth into everlasting sorrow? Were you men who had your eyes opened, would you not, every one of you — bitterly bewail your present danger, in the sense and apprehension of your speedy and eternal woe, and say, "Alas, what shall I do, when sickness shall come, and death shall come, and the Lord himself shall come — when I have no love for him? Woe is me! How shall I die, and after death appear at his tribunal — whom I never loved? Oh my poor departing soul — now as full of terror, as empty of the love of Christ — what will become of you, when you step out of time into eternity! Oh dreadful, dreadful, this is exceedingly dreadful — to leave all that I ever loved — and go to be judged by him whom I (woe to me that I did!) never loved. I loved my wife and children — but not Christ; and now I must leave them whom I so much loved — and receive my doom from him whom I so much hated. I loves my pleasures, and my sensual delights — and now there is an end of them. Now I must go unto those miseries, woes, and torments which shall never, never end! Woe is me, that now I am a dying man, and shortly, alas a day or two more, an hour or two more; so shortly, for lack of love to Christ — and I must be a damned man! When I was well, and did not love Christ, (well — and did not love Christ!) when I thought I was well without love to Christ, I thought my pleasures were sweet, my riches were my happiness, and my beloved relations were my joy. I thought my love was rightly placed upon them — but now upon this dying bed, when I look backwards upon time now past, and forwards into eternity, which never will be past — I find the remembrance of them torments my departing soul — they are as bitter as gall! For the more I loved them heretofore — the more they torment me now. Now! Woe is me — my torments will be forever! O! what did I mean — to give that love to them, which I should have given unto Christ! Had I loved him, as I loved them — then my love to him would have been as great a comfort to me, on this dying bed, as the love of them is now a terror to me. But I did not — O cursed fool that I am — that I did not love Jesus! And now the Lord, by death, has come to me; and after death I must go to him, to be judged by him, and in my sentence I shall hear God's Anathema, "Depart from me you who are cursed — into everlasting fire, prepared for the devil and his angels!" In that I never loved Christ, I sinned like the devil — and in my sentence, for that sin I must be condemned, and in Hell suffer with and as the devil." But yet all this may be prevented! And will you not endeavor it? How? By calling off your love from other things — and placing it supremely upon the Lord Jesus. By faith in him, and love unto him — the curse might be escaped, and the blessing obtained, at his coming. Had you rather be eternally condemned — than love Christ? Indeed! Is your enmity so much to him — that you had rather be miserable forever, than place your affections upon him? Are you not yet willing to forsake your old love to sin — and get new love to Christ? Can you be willing to be miserable, and pained, and tormented, in extremity, to all eternity? I know you cannot — and yet I know, whether you are willing or unwilling — without love to Christ, miserable you must be. O that you clearly saw, steadfastly believed, and distinctly apprehended the transcendent excellency, the amiable beauty, the invaluable worth of this Lord Jesus — that you might prize him more than gold and pearls, and costly jewels, and love him more than all. How is it that when you hear those on earth, who love him most — who so much complain of the smallness of their love to him — that you do not reflect upon yourselves, and say: "What sinners then are we, who have no love at all to him — and yet are not troubled, because we do not love him? For my own part, I mourn that I cannot love this blessed Jesus with that strength of love which I ought to love him, and earnestly desire to love him with. I grieve more, because I love him no more. I loathe myself so much the more, by how much I fall short of that love I ought to have to him. O that others may make up what I lack, and may be enlarged, and abound in that love — wherein I am straitened and defective. O that the degrees of love to Jesus which I cannot reach — others on earth might attain unto; that while I mourn for the smallness of my own love — I might rejoice in the greatness of the love of others unto this lovely Jesus. And yet when all this is infinitely less than he is worthy of — let it be some joy unto my grieved soul, that saved souls above, and angels in glory love him with a perfect and eternal love. Though I cannot love him as they do — yet I may rejoice on earth, that there are ten thousand times ten thousands, and thousands of thousands in Heaven, rejoicing in the fullness of love which is in them to him, when thousands upon earth never will, and millions in Hell never can, love this most lovely Lord Jesus Christ. But still I must grieve and groan, that when my Lord asks me, "Do you love me more than these?" Sometimes I doubt, and dare not say, "Lord, you know all things — you know that I love you!" But my heart pants, and my soul longs that my love to him might be inflamed — that the actings of it might be more vigorous, and the workings of it so sensible, that they may put me into pleasant pangs, and sweetest pains of love. Lord! I shall not account myself to be well, until I am sick with love to you — that so I may, from what I feel and find, in my own soul, recommend the sweetest delights, the rational pleasures, and the spiritual comforts — to the lovers of vanity, to allure and draw their love to Christ — that I may speak more of the unspeakable joy that fills the heart of a strong lover of Christ; and more pathetically persuade, more effectually plead — until God powerfully prevails with them, to turn the stream of their love (which now runs waste) into the right channel, and glide along until it empties itself into that sea of love, which saints and angels flow in unto Christ. 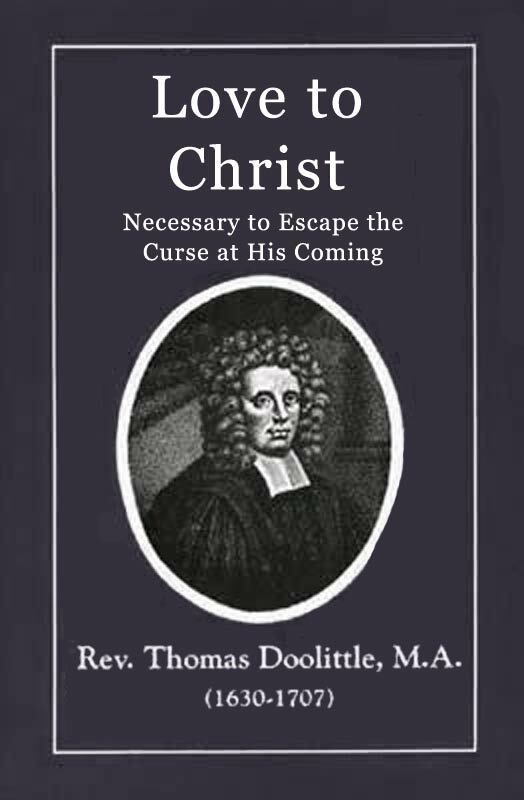 I have made a small attempt in this little treatise, to show the necessity of sincere love to Christ — whether God might move the hearts of any to fix their love upon him. I have written with as much plainness and gospel simplicity as I could. If any for this shall dislike it, when they have taken it up, and looked into it, and see it to be such — they may as easily lay it down, and slight it as they please. I am willing to be accounted a fool for Christ. I doubt not but I shall have more comfort on a dying bed, when I shall reflect that I aimed not at vain applause of dying men — but to gain the hearts, and the hearty love of the readers of these sermons. And if God will please to own them in men's reading, as he did in the hearing of them, by many, when not I, but the grace of God, did so much affect their hearts, that they some time later desired that it might be preached to them a second time, which I did; and these sermons successfully and effectually worked as at the first — not that I was anything, but God did all, both first and last. Very many, who confessed they did not love Christ, but world, and vanity, and sin, before — now desired all in the congregation earnestly to pray, that God would give them this love unto his Son, which I hope they have, and are increasing and growing therein. My fervent prayer is that God may bless this treatise to many poor, plain country people, whom my voice cannot reach, and to whom I cannot go. Amen. The Second Requisite of this Love. The Fourth Requisite of this Love. The Fifth Requisite of Love to Christ. The Sixth Requisite of Love to Christ. The Seventh Requisite of Love to Christ — the SINCERITY of it. The Tenth Requisite to Love to Christ — or the Worker of it. The Workings of this Love, as it is delighting, desiring, or mourning Love. The Description of Love to Christ. Ten Arguments that prove the Necessity of this love to Christ, for the avoiding of the Curse. Ten Properties of the Curse upon Non-Lovers of Christ. Eight reasons why Christ must be loved — or the sinner accursed. The APPLICATION of the Doctrine. Twenty Aggravations of lack of Love to Christ. Ten Questions, by way of conviction, that many, very many, have no sincere Love to Christ. The Fourth Use is an attempt to gain Sinner's Consent to love Christ — a serious wish for good success. Motives or Pleas, that Christ might have the Love of your Hearts.